West Bengal has bagged over Rs. 40,000 crore worth of investment proposals on the opening day of the flagship business summit, which was inaugurated by state Chief Minister Mamata Banerjee on Thursday. 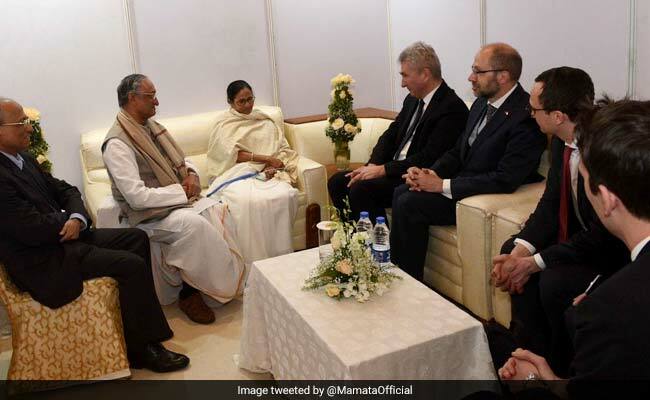 Over 4000 delegates from over 36 countries are participating in the two-day summit, being held at the Biswa Bangla Convention Centre in Rajarhat in the city. Addressing the fifth edition of the investors’ meet, Reliance Industries Chairman Mukesh Ambani said the group has firmed up Rs. 10,000 crore of investments in West Bengal, which is already under implementation. “In 2016, when I first attended the Bengal Global Business Summit, Reliance’s investments in the state were Rs. 4,500 crore. Today, our investments stand at Rs. 28,000 crore in West Bengal alone,” he said. Mr Ambani said this accounts for about one-tenth of our total investments in India so far. “Now, we have firmed up our plan for a further investment of over Rs. 10,000 crore. This plan is already under implementation,” he said. FMCG major ITC Ltd also proposed to make new investments of Rs. 1,700 crore in the state in its various businesses. The company’s committed investments in the state, with an outlay of Rs. 4,000 crore across agriculture, manufacturing and services, are “a reality and on the ground”, said its managing director Sanjiv Puri. “…we propose to make new investments of Rs. 1,700 crore in the near future, taking our recent total investments to Rs. 5,700 crore (in the state), which includes a FMCG personal care products manufacturing facility, investments in the decor paper manufacturing capacity in Tribeni to substitute imports, expansion of the Dhulagarh facility and others as well as milk productivity improvement and procurement programme across 300 villages in the state,” he said. JSW Group chairman Sajjan Jindal felt that West Bengal could become a trillion-dollar economy by 2032 and the group is in the process of “doubling” the capacity of its cement manufacturing plant to 4.8 million tonnes per annum at Salboni in West Midnapore district. According to state officials, the group proposed an investment of Rs. 7,000 crore (one billion dollar) in a pump storage (electricity) facility but the venue for the project has not yet been announced. H-Energy, part of the Hiranandani Group, also announced a prospective investment of Rs.2,000 crore towards new gas pipeline network in the state. Great Eastern Energy Corporation Ltd (GEECL), leading Indian coal bed methane (CBM) company, recently announced an upgrade in its resources at its Raniganj (South) block. RP Sanjiv Goenka Group’s Chairman Sanjiv Goenka said the group, which invested Rs. 23,000 crore over the last few years, found these investments fruitful. Another Rs. 500 crore worth of investments is being considered by Coca Cola and project details awaited, state Industries Minister Amit Mitra said.